Russian anarchist Mikhail Bakunin on the Paris commune and its relationship with Christianity and the government. THE COMMUNE, THE CHURCH & THE STATE. I am a passionate seeker for truth and just as strong an opponent of the corrupting lies, through which the party of order -- this privileged, official, and interested representative of all religions, philosophical political, legal economical, and social outrage in the past and present -- has tried to keep the world in ignorance. I love freedom with all my heart. It is the only condition under which the intelligence, the manliness, and happiness of the people, can develop and expand. By freedom, however, I naturally understand not its mere form, forced down as from above, measured and controlled by the state, this eternal lie which in reality, is nothing but the privilege of the few founded upon the slavery of all. Nor do I mean that "individualistic," selfish, petty, and mock freedom, which is propagated by J.J. Rousseau and all other schools of bourgeois liberalism. The mock freedom which is limited by the supposed right of all, and defended by the state, and leads inevitably to the destruction of the rights of the individual. No: I mean the only true freedom, that worthy of the name; the liberty which consists therein for everyone to develop all the material, intellectual, and moral faculties which lie dormant in him; the liberty which knows and recognizes no limitations beyond those which nature decrees. In this sense, there are no limitations, for the laws of our own nature are not forced upon us by a law-giver who, beside or above us, sits on a throne. They are in us, the real basis of our bodily and intellectual existence. Instead of limiting them, we must know that they are the real condition and first cause of our liberty. I mean that liberty of each which is not limited or restrained or curtailed by the liberty of another, but is strengthened and enlarged through it: the unlimited liberty of each through the liberty of all, liberty through solidarity, liberty in equality. (Political, & economical and social.) The liberty which has conquered brute force and vanquished the principle of authority, which is, always, only the expression of that force. The liberty, which will abolish all heavenly and earthly idols, and erect a new world of fellowship and human solidarity on the ruins of all states and churches. I am a confirmed disciple of economic and social equality. Outside of this, I know, freedom, justice, manliness, morality, and the welfare of the individual as well as that of the community, can only be a hollow lie, an empty phrase. This equality must realise itself through the free organisation of labour and the voluntary cooperative ownership of the means of production, through the combination of the productive workers into freely organised communes, and the free federation of the communes. There must be no controlling intervention of the state. This is the point which separates, especially, the revolutionary socialists from the authoritarian i. e. marxian socialists. Both work for the same end. Both are out to create a new society. Both agree that the only basis of this new society shall be: the organisation of labour which each and all will have to perform under equal economic conditions, following the demands of nature; and the common ownership of, everything that is necessary to perform that labour, lands, tools, machinery, etc. But, where as, the revolutionary socialists believe in the direct initiative of the workers themselves through their industrial combinations, this is anarchist stand point in contradiction to marxian or as it claims to be scientific. The authoritarians believe in the direct initiative of the state. They imagine they can reach their goal with the help of the radical parties (now it should be understood as communist) through the development and organisation of the political power of the working-class, especially the proletariat of the big towns, due to concentration of large industries employing large mass of proletariat. But the revolutionary socialists oppose all these compromising and confusing alliances. They are convinced that the goal of a free society can only be reached through the development and organisation of the non-political, but social power of the working class of both town and country, with the fusion of forges of all those members of the upper class who are willing to declass themselves and ready to break with the past, and to combine together for the same demands. The revolutionary socialists are opposed, therefore, to all politics. 1) The organisation of the representative or political strength of the proletariat for the purpose of capturing political power in the state in order to transform society. 2) The organisation of the direct strength, the social and industrial solidarity of the proletariat for the purpose of abolishing all political power and the state. The advocates of both methods believe in science which is out to slay superstition, and which shall take the place of religious church belief. But the former propose to force it into humanity, whilst the latter seek to convince the people of its truth, to educate them everywhere, so that they shall voluntarily organise and combine-freely, from the bottom upwards through individual initiative and according to their true interests, but never according to a plan drawn up before hand for the "ignorant masses" by a few intellectually superior persons. Revolutionary-now known as libertarian socialists believe that, in the instinctive yearnings and true wants of the masses, is to be found much sound reason and logic than in the deep wisdom of all the doctors, servants, and teachers of humanity who, after many disastrous attempts, still dabble in the problem of making the people happy. Humanity, think they, has been ruled and governed much too long and so they think this state of the affairs should continue. Indeed the source of people's trouble, lies not in this or that form of government, but in the existence and manifestation of Government itself, whatever form it may assume. This is the historical difference between the authoritarian communist ideas, scientifically developed through the German Marxist school and partly adopted by English and American Socialists, on one hand and the Anarchist ideas of Joseph Pierre Proudhon which have educated the proletariat of the Latin countries and led them intellectually to the last consequences of Proudhon's teachings This latter revolutionary or libertarian socialism has now for the first time, attempted to put its ideas into practice in the Paris Commune. I am a follower of the Paris Commune, which, though dastardly murdered and drowned in blood by the assassins of the clerical and monarchial reaction, yet lives, more than ever, in the imagination and hearts of the European proletariat. I am its follower, especially because of the feet that it was a courageous, determined, negation of the state. It is a fact of enormous significance, that this should have happened in France, hitherto the land of strongest political centralisation; that it was Paris, the head and creator of this great centralisation, which made the start- thus destroying itself and proclaiming with joy its fall, in order to give life to France, to Europe, to the whole world; thus revealing to all enslaved people-and who are the people who are not slaves-the only way to liberty and happiness; delivering a deathly stroke against the political traditions of bourgeois liberalism, and giving a sound basis to revolutionary socialism. Paris thus earned for itself the curses of the reactionaries of France and Europe. It inaugurated the new era, that of the final and entire liberation of the people,and their truly realised solidarity, above and in spite of all limitations of the State. Proclaimed the religion of humanity. Made manifest its humanism and atheism, and substituted the great truths of social life and science for godly lies. Paris, heroic, sane, unflinching, asserted its strong belief in the future of humanity. It substituted liberty, justice, and fraternity for the falsehood and injustice of religious and political morality. Paris, choked in the blood of its children, symbolised humanity crucified by the international united reaction of Europe at the direct inspiration of the churches and the high priests (Politicians) of injustice. 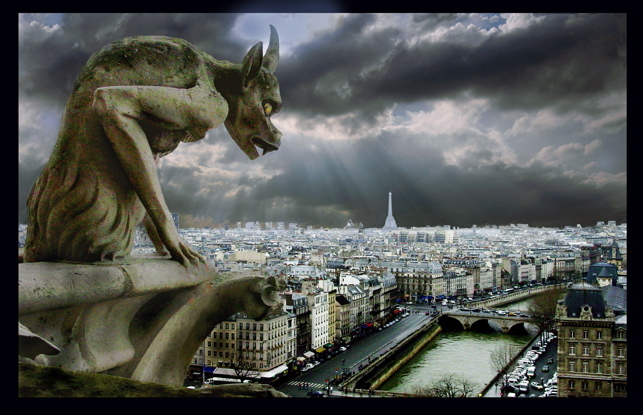 The next international upheaval of humanity will be the resurrection of Paris. Such is the true meaning and the beneficial and immeasurably important results of the two-months' existence and memorable fall of the Paris Commune. It lasted only a short time. It was hampered too much by the deadly war it had to wage against the Versailles reaction and Holy Alliance. Consequently, it was unable to work out its Socialist programme, even theoretically, much less practically. The majority of the members of the Commune, even, were not Socialists in the real sense of the word. And if they acted as Socialists, it was only because they were irresistibly carried away by the nature of their surroundings, the necessity of their position, and not by their own innermost convictions. The Socialists, led by our friend Varlin, formed in the Commune only a disappearingly small minority say fourteen or fifteen members. The rest consisted of Jacobins. But we must discriminate between Jacobins and Jacobins. There are doctrinaire Jacobins like Gambetta whose, oppressing lust for power and formal republicanism has lost the old revolutionary fire, and preserved only a respect for centralised unity and authority. This was the Jacobinism that betrayed the France of the people to the Prussian conquerors, and then to the native reaction. But there were honest revolutionary Jacobins also, the last heroic decendants of the democratic impulse of 1793, men and women who could sacrifice their centralised unity and well-armed authority to the needs of the revolution rather than bend their conscience before the obnoxious reaction. In the vanguard of these great-hearted jacobins we see Delecluse, a great and noble figure. Before everything he desired the triumph of the revolution; and as, without the people, no revolution is possible, as the people are Socialistically inclined, and could not be won for any other revolution than a social or economic one, Delecluse and his fellow honest Jacobins allowed themselves to be carried away by the logic of the revolutionary movement. Without desiring it, they became revolutionary Socialists, and signed proclamations and appeals whose general spirit was of a decidedly Socialist nature. But, in spite of their honesty and goodwill, their Socialism was the product of external circumstances rather than inner conviction. They had neither the time nor the ability to overcome bourgeois prejudices diametrically opposed to their newly acquired Socialism. This internal conflict of opinion weakened them in action. They never got beyond fundamental theories, and were unable to come to decisive conclusions such as would have severed their connection with bourgeois society once and for all. This was a great calamity for the Commune and for the men themselves. It paralysed them, and they paralysed the Commune. But we must not reproach them on that account. Man does not change in a day, and we cannot change our natures and customs overnight. The Jacobins of the commune have shown their honesty by suffering themselves to be murdered for it. Who can expect more of them? Even the people of Paris, under whose influence they thought and acted, were Socialists more by instinct than by well-balanced conviction. All their yearnings were in the highest degree entirely Socialistic. But their thoughts were expressed in traditional forms for removed from this height. Among the proletariat of the French towns, and even of Paris, many Jacobins prejudices still remain. Many false ideas about the necessity of dictatorship and government still flourish. The worship of authority-the inevitable result of religious education, that eternal source of all evil, all degradation, all enslavement of peoples-has not yet been entirely removed from its midst. So much is this the case that even the most intelligent sons of the people, the self-conscious Socialists of that time, have not yet been able to free themselves from this superstition. Were one to dissect their minds, one would find the Jacobin, the believer in government, huddled together in a little corner, forsaken and almost lifeless, but not quite dead. Besides, the position of the small minority of class conscious and revolutionary Socialists in the Commune was very difficult. They felt that they lacked the support of the mass of the Paris population. The organisation of the International Workers' Association was very imperfect, and it only had a few thousand members. With this backing, they had to fight daily against a Jacobin majority. And under what circumstances! Daily they had to find work and bread for several hundred thousand workers, to organize and arm them, and to guard against reactionary conspiracies. All in a town like Paris, beleaguered, menaced with starvation, and exposed to all underhand attacks of the reaction which had established itself in Versailles by kind permission of the Prussian Conqueror. They were forced to create a revolutionary government and army in order to oppose Versailles government and army. They had to forget and violate the first principles of revolutionary Socialism, and organise themselves as a Jacobin reaction, in order to fight the monarchical and clerical reaction. It is obvious that, under these circumstances, the Jacobins were the stronger party. They were in a majority and possessed superior political cunning. Their traditions and greater experience in the organisation of government gave them a gigantic advantage over the few genuine Socialists. But the Jacobins took little advantage of this fact; they -did not strive to give to the uprising of Paris a distinctive Jacobin character, but allowed themselves to drift into a social revolution. Many Socialists, very consequential in their theory, reproach our Paris comrades with not having acted sufficiently Socialistic, whilst the barkers of the bourgeois forces accused them of having been too loyal to the Socialist programme. We will leave the latter gentry on one side now, and endeavour to convince the stern theorists of the liberation of labour that they are unjust to our Paris brethren. Between the best theories and their practical realisation is a gigantic difference, which cannot be covered in a few days. Those of us who knew for instance, our friend Varlin-to mention only him whose death was certain-how strong, well considered, and deep-rooted were the convictions of Socialism in him and his friends. They were men whose enthusiasm, honesty, and self-sacrifice nobody could doubt. Their very honesty make them suspicious of themselves, and they underestimated their strength and character in face of the titanic labour to which they were consecrating their life and thought. Besides, they had the right conviction that, in the social revolution-which in this, as in every other respect, is the direct opposite of political revolution-the deeds of the single leading personality nearly disappear, and the independent, direct reaction of the masses count as everything. The only thing which the more advanced can do is to work out, spread, and explain the ideas which suit the requirements and ideals of the people, and contribute to the national strength of the latter by working untiringly on the task of revolutionary organisation-nothing more. Everything else can and must be accomplished by the people themselves. Otherwise we would arrive at political dictatorship; that is, a re-instatement of the State, privilege, inequality, persecution; a re-establishment, by a long and roundabout way, of political, social, and economic slavery. Varlin and all his friends; like all true Socialists, and like the average worker who is born and bred amongst the people, experienced in highest degree this well justified fear of the continued initiative of the same men, this distrust of the rule of distinguished personalities. Their uprightness caused them to turn this fear and suspicion as much against themselves as against others. In opposition to the, in my opinion, entirely erroneous idea of State Socialists, that a dictatorship or a constitutional assembly-that has emerged from a political revolution-can proclaim and organise the social revolution by laws and degrees, our Paris friends were convinced that it could only be brought about and developed through the independent and unceasing efforts of the masses and the groups. They were a thousand times right. Where is the head, however genial, or-if one speaks of the collective dictatorship of an elected assembly, even if it consists of several hundred uncommonly well educated people-where is the brain that is mighty and grasping enough to grasp the unending number and multitude of true interests, yearnings, wills, and requirements, the sum total of which constitute the collective will of the people? And who could invent a social organisation which would satisfy every want-- such an organisation would be nothing less than a torture-chamber, into which the more or less aggressive State would put unhappy society. This has always happened up to now. But the social revolution must make an end of this antiquated system of organisation. It must give back to the masses, the groups, communes, societies, even to every man and woman, their full and unrestricted liberty. It must abolish, once and for all, political power. The State must go. With its fall must disappear all legal rights, all the lies of various religions. For law and religion were always only the forged justification for privilege outrages and established aggression. It is clear that liberty can only be restored to mankind, and that the true interests of society, of all groups, all local organisations, as well as every single, being can be entirely satisfied entirely only when all States have been abolished. All the so-called "common interests of society" which are supposed to be represented by the State, are in reality nothing else than the entire and continued suppression of the true interests of the districts, communes, societies, and individuals which are subservient to the State. They are an imagination, an abstract idea, a lie. Under the guise of this idea of representing common interests, the State becomes a vast slaughter-house or cemetery, wherein is slain all the living energy of the people. But an abstract idea can never exist for itself and through itself. It has no feet with which to walk, no arms with which to work, no stomach in which to digest its slaughtered victims. The religious idea, God, represents, in reality, the self-evident and real interests of a privileged class, the clergy, who represent the earthly half of the God idea. The State, the political abstraction, represents as real and self evident interests of the bourgeoisie. Today, that class is the most important and practically only exploiting class, which is threatening to swallow up all other classes, Priesthood is developing gradually into a very rich and mighty minority, but is rather relegated and with poor majority. The same is true of the bourgeoisie. Its political and social organisations are every day making for a real ruling oligarchy, to whom a majority of more or less conceited and impoverished bourgeois creatures who are obliged to serve the almighty oligarchy as blind tools. This majority lives in a continuous illusion, and is, through the irresistible power of economic development, unavoidably and ever more pulled down to the ranks of the proletariat. The abolition of Church and State must be the first and essential condition for the true liberation of society. Only afterwards can and must society organise itself on a new basis. But not from the top downwards, after a more or less beautiful plan of a few experts or theorists, or on the Strength of decrees of a ruling power, or through a universal-suffrage-elected Parliament. Such a proceeding would lead inevitably to the creation of a new ruling aristocracy, i.e., a class who have nothing in common with the people. This class would exploit and bleed the people under the presence of the common welfare. Or in order to preserve the new State. The organisation of the society of the future must and can be accomplished only from the bottom upwards, through the free federation and union of the workers into groups, unions, and societies, which will unite again into districts, communes, national communes, and finally form a great international federation. Only thus can be evolved the true vital order of liberty and happiness for all, the order which is not opposed to the interests of the individual or of society, but on the contrary strengthens the same and brings them into harmony. It is said that the harmony and the solidarity between the interests of the individual and society can never be effected, because of an inherent antagonism. But if these interests never and nowhere did harmonise, up to now, it has been the fault of the State in sacrificing the interests of the majority of the people to the gain of a small privileged minority. This oft-mentioned opposition of personal and social interests is only a swindle and political lie, which originated through the religious and theological lie of the Fall-a dogma which was invented to degrade man and destroy his consciousness of his own value. Support was lent to this false idea of antagonism of interests by little speculation of the metaphysical philosophies. These are closely related to theology. Metaphysics over-look the fact that man is a social animal, however, and view society as a mechanical and wholly artificial conglomeration of individuals, who suddenly organise themselves on the basis of a secret or sacred compact out of their free will or at the dictation of a higher power. Before coming together in this fashion, these individuals had boasted an eternal soul and lived in alleged unlimited liberty! But when the metaphysicians, especially those who believe in the immortality of the soul, assert that men, outside society, are free beings, they maintain that men can enter into society only by denying their freedom and natural independence, and sacrificing both their personal and local interests. This denial and sacrifice of the ego becomes greater the more developed the society and the more complicated ,its organisation. From this viewpoint the State becomes the expression of individual sacrifice, which all have to bring to its altar. In the name of the abstract and outrageous lie called "the common good," and "law and order" it imperils increasingly all personal liberty, in the interests of the governing class it exclusively represents. Hence the State appears to us as an inevitable negation and destruction of all liberty, all personal, individual, and common interests. Everything in the metaphysical and theological system follows and solves itself. Therefore the upholders of these systems are obliged to exploit the masses through the medium of Church and State. Whilst filling their pockets and satisfying all their filthy desires, they tell themselves that they work for the honour of God, the triumph of civilisation, and the eternal welfare of the proletariat. Our idealistic opponents, the theologian and metaphysicians, take the abstract "liberty" as the foundation of their theories. It is then quite easy for them to draw the conclusion that slavery is the indisputable condition of human existence, who are in our empirical scientific theory, materialists, strive in practice for the triumph of a sane and noble idealism. We are convinced that the whole wealth of the intellectual, moral and material development of humanity, as well as its seeming independence, is due to the fact that man lives in society. Outside of society man would not only not have been free. He would not even have been capable of becoming a man, i. e., a self-conscious being, capable of thought and speech. Thinking and working together lifted man out of his animal condition. We are absolutely convinced that the whole life of man is a social product. His interests, yearnings, needs, dreams, and even his foolishness, as well as his brutality, injustice, and actions, depending, seemingly, on free will, are only the inevitable results of forces at work in our social life. Men are not independent of each other, but each influences the other. We are all in continual co-relation with our neighbours and surrounding nature. Order is possible and natural in world system only when the latter is a previously thought out arrangement imposed upon mankind from above. The Jewish religious imagination of a godly law-giver makes for unparalleled nonsense, and the negation not only of all order, but of nature itself. '`The laws of nature" relate only to the goal of nature itself. The phrase is not true if used to mean laws decreed by an outside authority. For these "laws" are nothing else than the continual adaptation which is part of the evolution of things, of the working together of vastly different passing but real facts. The sum total of all action and interaction is what we call "nature." The thoughts and science of man observe these phenomena, controlled and experimented with them and finally united them into a system, the single parts of which are called "laws." But nature itself knows no laws. Nature acts unconsciously. In itself it demonstrates the unending difference of its necessarily appearing and self repeating phenomena. This is how, thanks to the inevitableness of activity, the common order can and does exist. So with human society, which apparently develops against nature, but in reality goes hand in hand with the natural and inevitable development of things. Only the superiority of man over the rest of the animals and his highly developed thinking ability brought a special feature into his evolution-also, by the way, quite natural since man, like everything else, is the material result of the working together and union of natural forces. This special feature is the calculating, thinking ability, the power of induction and abstraction. Through this man has been able to carry his thoughts outside himself, and so observe and criticism himself as a thing apart, some strange or foreign object. And as he, in his thoughts, lifts himself out of himself and the surrounding world, he arrives at the idea of the entire abstraction, the pure nothingness, the absolute. But this represents nothing beyond man's own ability to abstract thought, which looks down on all that is and finds peace in the entire negation of all that is. This is the very limit of the highest abstraction of thought: this is God. Herein is to be found the spirit and historical proof of every theological and religious doctrine. Man did not understand nature and the material foundation of his own thoughts. He was unconscious of the natural circumstances and powers which were characteristic of them. So he failed to realise that his abstract ideas only expressed his own ability to abstract thought. Therefore, he came to regard the abstract idea as something really existing something before which even nature sank into insignificance And so he worshiped and honored in every conceivable fashion this unreality of his imagination. But it became necessary to imagine more clearly and to make understood somehow this Goal, this supreme nothingness which seemed to contain all things in essence but not in fact. So primitive man enlarged his idea of God. Gradually he bestowed on the deity all the powers which existed in human society, good and bad, virtuous and vicious. Such was the beginning of all religions, such their evolution from fetish worship to Christianity. We will not stop to analyses the history of religious, theological, and metaphysical nonsense, nor speak about the ever occurring godly incarnations and visions which have happened during centuries of human ignorance. Everyone knows that these superstitions occasioned terrible suffering, and their progress was accompanied by rivers of blood and much mourning. All these terrible errors of poor humanity were inevitable in the evolution of society. They were the necessary effect, the natural consequence of that all powerful idea that the universe is governed and conditioned by a supernatural power and will. Century succeeds century. Man becomes more And more used to this belief. Finally it seeks to crush and to kill every effort towards any higher development. The mad desire to rule or to govern, first on the part of a few men, then of a certain class, demanded that slavery and conquest should be accepted as the underlying principles of society. This, more than anything else, strengthened the terrible belief in a God above. Consequently, no social order could exist without being founded on the Church and State. All doctrinaires defend both of these outrageous institutions. Did the priests and aristocrats really and truly believe in these institutions which they were endeavoring to uphold with all their power, and to their own benefit Or were they only lairs and hypocrites? In my opinion the, were honest believers and dishonest deceivers simultaneously. They themselves believe , since they participated, naturally, in the errors of the masses. Only later,at the time the old world declined-that is, in the Middle Ages did they become unbelievers and shameless liars. The founders of states can be regarded also as honest men. Man readily believes that which he desires and that which is not detrimental to his own interests. It makes no difference if he is intelligent and educated. Through his egotism and his desire to live with his neighbours and to profit by their estimation he will believe always only in that which is useful and desirable to him. I am convinced, for instance, that Thiers and the Versailles government were trying to convince themselves, violently, that they were saving France by murdering several thousand men, women, and children. Even if the priests, prophets, aristocrats, and bourgeois of all times were honest believers, in spite of all, they were parasites. One cannot suppose that they believed every bit of nonsense in religion and politics which they taught the masses. I will not go so far back as to the time when two Augurs in Rome were unable to look into each others face without smiling. It is hard to believe that even in the time of mental darkness and superstition the inventors of miracles were convinced of their truth. The same may be said of politics, where the motto is: "One must understand how to govern and rob a people so that they do not complain too much or forget to be subservient, so that they get no chance to think of resentment and revolt." How can one possibly believe after this that the men who make a business out of politics, and whose goal is injustice, violence, lies, treason, single, and wholesale murder, honestly believe that the wisdom and art of ruling the State make for the common wealth? In spite of all their brutality they are not so stupid as to think this. Church and State were in all times the schools of vice. History testifies to their crimes. Ever and always were priest and politician the conscious, systematic, unyielding, bloodthirsty enemies and executioners of the people. But how can we reconcile two seemingly opposed things like cheater and cheated, liar and believer? In thought it looks difficult, but in life we find the two often together. The great bulk of mankind live in a continual quarrel and apathetic misunderstanding with themselves, they remain unconscious of this, as a rule, until some uncommon occurrence wakes them up out of their sleep, and forces them to reflect on themselves and their surroundings. In politics, as well as in religion, man is only a machine in the hands of his oppressors. But robber and robbed, oppressor and oppressed live side by side, ruled by a handful of people, in whom one recognises the real oppressors. It is always the same type of men, who, free of all political and religious prejudice, consciously torture and oppress the rest of the people. In the 17th and 18th century, until the advent of the great revolution, they ruled Europe and did as they liked. They do the same today. But we have reason to hope that their rule will be over soon. History teaches us that the chief priests of Church and State or also the sworn servants and creatures of these damnable institutions. Whilst consciously deceiving the people and leading them into disaster, these persons are concerned to uphold zealously the sanctity and unapproachability of both establishments. The Church, on the authority of all priests and most politicians, is essential to the proper care of the people's souls; and the State is indispensable, in their opinion, for the proper maintenance of peace, order, and justice. And the doctrinaires of all schools exclaim in chorus: "Without Church or government progress and civilisation is impossible." We make no comment on the heavenly hereafter, since we do not believe in an immortal soul. But we are convinced that nothing offers a greater menace to truth and the progress of humanity than the Church. How else could it be ? Is it not the task of the Church to chloroform the women and children . Does she not kill all sound reason end science with her dogmas, and degrade the self-respect of man by confusing his ideas of right and justice ? Does she not preach eternal slavery to the masses in the interest of the ruling and oppressing class ? And is she not determined to perpetuate the present reign of darkness, ignorance, misery, and crime ? For the progress of our age not to be an empty dream, it must first sweep the Church out of its path.